Junior Genius Kits are built for experimentation, learning and fun! Experience the joy of seeing your first LED light up. 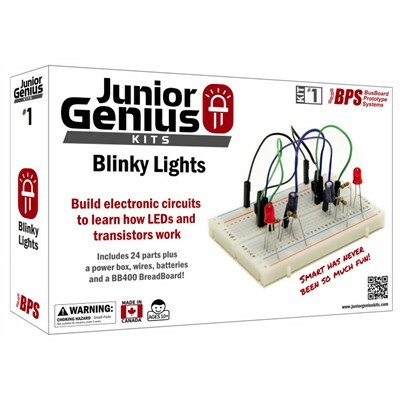 The Blinky Lights Kit leads you through 10 core activities, from a simple LED circuit up to more advanced transistor LED blinky light circuits, using standard parts on a real-world breadboard. Learn about voltage and current by using LEDs, resistors, capacitors and transistors. You'll be able to build circuits using a schematic diagram, and there's plenty of help to get you there. Simple examples make it easy to grasp the basics and 'What's Happening' and 'Things To Try' sections encourage you to dig deeper. Includes 24 parts plus a power box, ZipWires, batteries and a BB400 BreadBoard. Junior Genius Online Club Access to additional content, knowledge & activies.